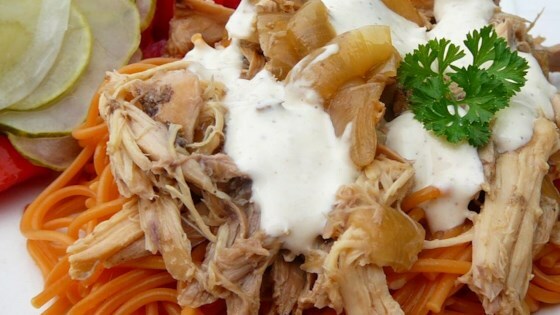 "Tender pulled chicken with a southern white sauce. This wonderful pulled chicken has the perfect balance of seasoning with a hint of Alabama BBQ. The sauce is not overly powerful but you can always add more or leave it off and still have a great tasting pulled chicken for sandwiches or plain. I searched and searched for an easy slow cooker pulled chicken recipe that would be similar to a popular BBQ restaurant. I never found one, so here's my own recipe. My family of six loves this. Keep remaining sauce refrigerated until ready to serve. Great to spread on sandwich, lettuce leaf, or drizzle over chicken on plate." Spread onion out in the bottom of a slow cooker. Whisk 3/4 teaspoon salt, 1/2 teaspoon black pepper, paprika, and poultry seasoning together in a small bowl. Place garlic cloves inside chicken cavity, brush chicken all over with melted butter, and sprinkle paprika mixture all over chicken. Place chicken, breast-side up, into slow cooker. Pour water into slow cooker and sprinkle liquid smoke over chicken. Cook on High for 1 hour. Reduce heat to Low and cook for 8 hours. Remove meat from bones, shred meat with two forks, cut onions in half, and return meat and onions to slow cooker. While chicken is cooking, whisk mayonnaise, cider vinegar, white sugar, remaining salt, remaining black pepper, and cayenne pepper together in a bowl until sauce is smooth. Cover the bowl with plastic wrap and refrigerate until flavors blend, at least 1 hour. Pour 2 to 3 tablespoons sauce over chicken mixture and continue cooking on Low for 1 hour. If you want the sauce to have more of a kick, you may increase the pepper to 1/2 teaspoon or add horseradish sauce. This is simply melt in your mouth delicious! You can make the day before and refrigerate. Then the next morning set crock out in room temp for about an hour then heat on high for about and hour, then turn crock down to warm until ready to serve. You'd probably be able to reheat in oven as well. Great for potlucks or family gatherings! Nutrition data for this recipe includes the full amount of white sauce ingredients. The actual amount of white sauce consumed will vary. I used a whole chicken and found this to be a lot of work. While eating, I had to watch for bones. Next time, I think I will use chicken breasts instead. And, there was no much taste.